Daily Prompt: What was your favorite plaything as a child? Do you see any connection between your life now, and your favorite childhood toy? I’ve decided that there is no way I can pick a favorite toy or plaything from my childhood. I had so many things I loved when I was young. My sisters and I played dolls a lot and I always loved that. We played with the troll dolls too. All the girls in the neighborhood had troll dolls and we always had hours of fun with those. Maybe that’s a post for another time! I’ll try to narrow it down for the sake of this prompt. I really enjoyed playing with and making Creepy Crawlers when I was a kid. Does anyone remember those? 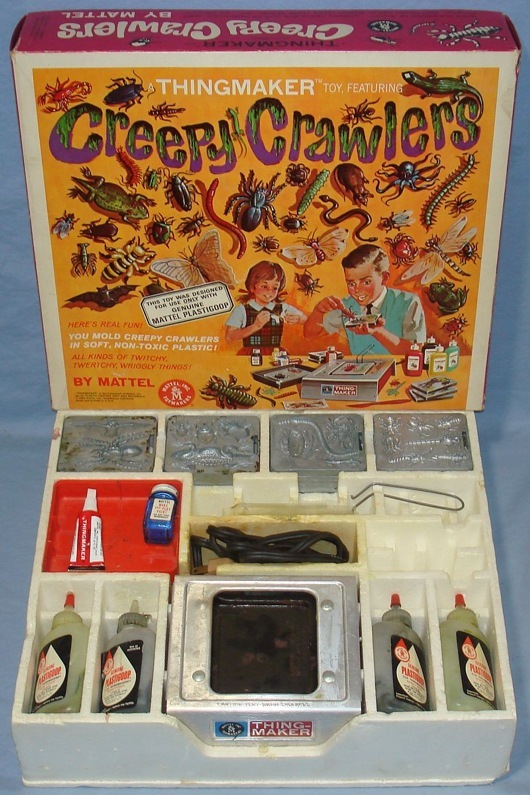 Each Creepy Crawler set came with a little metal oven (a Thingmaker) that got hot as blazes and probably could have burnt the house down (and yes we usually played with them unsupervised). There were 9 metal molds, and several bottles of Plastigoop that you poured into the various molds and then cooked the molds in the Thingmaker to make your bugs. It was so much fun trying to be creative and “designing” your own colorful bugs. 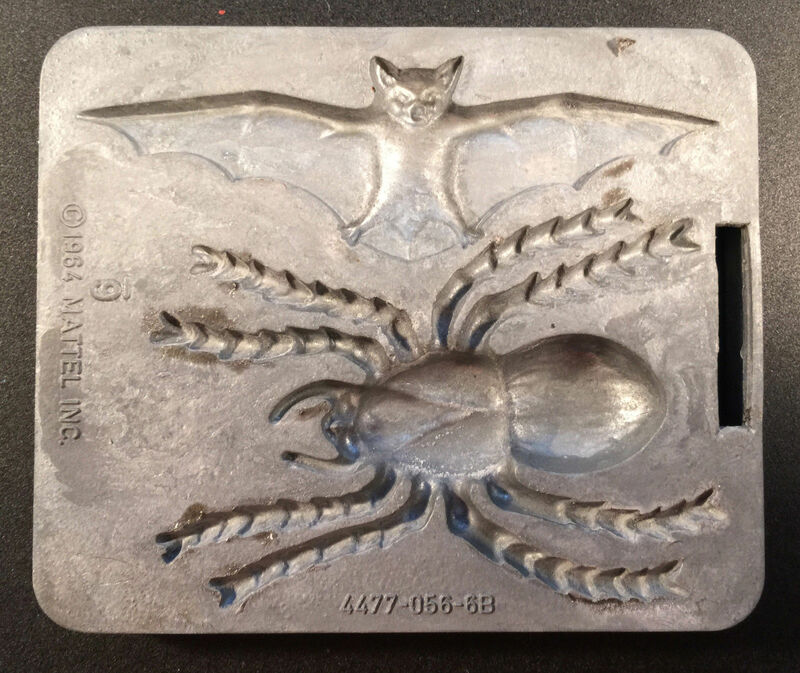 The bat and spider Creepy Crawler mold. My favorite. Whoever came up with Creepy Crawlers was a genius in my opinion. So much fun! I am a wife, mother, sister, aunt, friend, veterinarian, and wanna be writer. I love nature and animals of all kinds, music, cooking, and spending time with my family. This entry was posted in Daily Prompt and tagged childhood, Creepy Crawlers, favorite toy of the 1960s, memories, Thingmaker, Wordpress daily prompt. Bookmark the permalink. I bought both my kids a set when they were younger. Of course, the ovens are made to be more child-safe now! They didn’t come with near as many molds and I think the molds are plastic now instead of metal. It made me wish I had saved all my molds but my whole set got thrown away. Now, Creepy Crawlers really takes me back to a time long ago. Great Posting. Thanks! It provided hours of fun, didn’t it? Thanks for stopping by! Mine and that of my son’s kind of toy. Lately my 9-year old had us buy him Kinetic sand and Jelly-like egg with dinosaur in it…perfect timing as we recently watched Jurassic World. Have a great fun Summer and best of blessings to you and your family. God bless. At least as of a few years ago, you could still buy these. My kids got one for Christmas. I may still have it somewhere. They went through many bottles of goop. Did you also have Incredible Edibles? They were a similar idea – making bugs, etc, but they were edible. We made so many of those when I was growing up. Brian and Adam both had one and I think they are still here. I did not have Incredible Edilbles but a neighbor friend did and I remember him making one for me “to try.” I think my sister had the Fun Flowers set that made all kinds of flowers.